At the age of 6, Ryan Hreljac was inspired to raise money for digging wells and providing clean water in developing countries. His first-grade teacher presented a list of needed supplies in Africa, encouraging Hreljac to earn the money by performing household chores and raising funds in his community. In January 1999, his first well was built near a primary school in northern Uganda. Hreljac continued his fundraising and, in 2001, with the support of his family established the Ryan’s Well Foundation. Since then, Ryan’s Well Foundation has raised over $1 million for 878 water projects and 1,120 latrines in 16 countries. 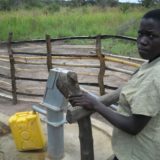 Wells have been constructed in many African countries, including Malawi, Zimbabwe, Ethiopia, Tanzania, Uganda, Kenya and Nigeria. Ryan’s Well Foundation has given over 150,000 adults and children access to clean water. Ryan plans to pursue a career in water engineering, thus continuing to provide clean water to people around the world. After over a decade, Ryan returned to his first well in Uganda in May 2014. It was the 15th anniversary celebration of his very first well at Angolo Primary School. Watch the full video on Ryan’s trip here. Since Ryan was first honored by World of Children in 2003, he has helped motivate youth to become more engaged in the world water crisis through public speaking events in more than 40 countries. He has helped to educate students around the world about the importance of clean water and encouraged students to become active, responsible citizens of the planet. Ryan’s Wells Foundation now has more than 1,000 wells and has helped over 300,000 children live healthier lives since 2003.